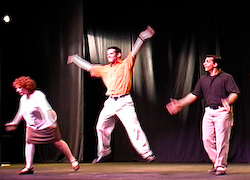 Laugh Out Loud TheaterThe Place for Hilarious Improv Comedy in Chicago's Northwest Suburbs! The Chicago Comedy Company always plays at the top of our intelligence, and is dedicated to providing our clients and their audiences with clean, inclusive entertainment. Why Do a Comedy Show? Sometimes you need a little spice during your corporate gatherings. We know these events can be a little dry: presenters can linger a bit too long, and things can get tense when nobody knows how to fix the PowerPoint projector. You can accomplish more than you anticipate when it doesn't feel like work. 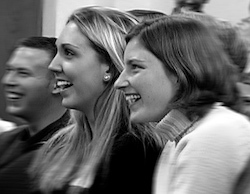 Bring in Chicago Comedy Company to present your policy, strategy, or initiative in a fun way that has lasting impact. Or, after your dinner of chicken marsala and rice pilaf, we can provide a comedy show to say "thank you" to your employees for taking time to attend a company function. We will work within your budget and agenda to create an original performance that will delight your audience. We customize each performance to fit your needs. Whether you are looking for hilarious improv, inventive sketches written just for you, or a blend of both, we will deliver a memorable event. Due to its spontaneous, audience-interactive nature, Improvisational Comedy is a "you-have-to-see-it-to-believe-it" phenomenon. During the show, we take suggestions from the audience and turn them into smart, funny scenes on the spot. We're experts at keeping an audience involved, whether shouting out ideas or volunteering to join us on stage. We can further customize the show by dropping in information you provide us in advance, creating improv games to fit your company or industry. Our crisp, well-rehearsed comedy sketches are written using information you provide. These scenes may reflect life at your company, convey important information, playfully highlight facts and figures, or simply to have fun with your boss and fellow employees. We can also incorporate serious content and key information by weaving it into our show to provide learning through laughter. Bring us in early to design an imaginative experience for your exhibit booth, corporate meeting, or special event. Our staff will brainstorm ideas for you to choose from, and keep you updated as we create sketches and custom material. You will see scripts well in advance of your show and have the opportunity to offer feedback. We're the comedy experts, but you know your audience and your event, and that makes you part of our creative team. While it is beneficial to have as much lead time as possible, if you have a last minute request, we can still cook up a show with just a phone call, a time and a place. © 2019 Laugh Out Loud Inc.